Contactless payment systems are credit cards and debit cards, key fobs, smart cards or other devices, including smartphones and other mobile devices, that use radio-frequency identification (RFID) or near field communication (NFC) for making secure payments. The embedded chip and antenna enable consumers to wave their card, fob, or handheld device over a reader at the point of sale terminal. Contactless payments are made in close physical proximity; they are usually distinguished from mobile payments which can also take place on mobile phones, but mobile payments use broad-area cellular or WiFi networks and do not involve close physical proximity. Some suppliers claim that transactions can be almost twice as fast as a conventional cash, credit, or debit card purchase. Because no signature or PIN verification is typically required, contactless purchases are typically limited to small value sales. Lack of authentication provides a window during which fraudulent purchases can be made. Research indicates that consumers are likely to spend more money using their cards due to the ease of small transactions. MasterCard Canada says it has seen "about 25 percent" higher spending by users of its Mastercard Contactless-brand RFID credit cards. EMV is a common standard used by major credit card and smartphone companies for use in general commerce. Contactless smart cards that function as stored-value cards are becoming popular for use as transit system farecards, such as the Oyster card or RioCard. These can often store non-currency value (such as monthly passes) in additional to fare value purchased with cash or electronic payment. McDonald's, KFC, Burger King, Boots, Eat, Heron Foods, Pret a Manger, Stagecoach Group, Subway, AMT Coffee, Tesco, Asda and Lidl are among the retailers offering contactless payments to their customers in the UK. In March 2008, EAT. became the first restaurant chain to adopt contactless. Major financial entities now offering contactless payment systems include MasterCard, Citibank, JPMorgan Chase, American Express, KeyBank, Barclays, Barclaycard, HSBC, Lloyds Banking Group, Freedompay, The Co-operative Bank, Nationwide Building Society and The Royal Bank of Scotland Group. Visa payWave, American Express Expresspay, and MasterCard Contactless are examples of contactless credit cards which have become widespread in U.S. and UK. The UK (and the rest of the world) version of the contactless applications differ from the U.S. one. The UK version has the capability of transacting offline, based on the limit stored in the application. The first contactless cards in the UK were issued by Barclaycard in 2007. As of December 2014, there are approximately 58 million contactless-enabled cards in circulation in the UK and over 147,000 terminals in use though this is growing in numbers and percentages of adoption. Telecom operators are starting to get involved in contactless payments via the use of near field communication phones. Belgacom's Pingping - Belgium, for example, has a stored value account and via a partnership with Alcatel-Lucent's touchatag provides contactless payment functionalities. In January 2010, Barclaycard partnered with mobile phone firm Orange, to launch a contactless credit card in the UK. Orange and Barclaycard also announced in 2009 that they will be launching a mobile phone with contactless technology. In October 2011, the first mobile phones with MasterCard PayPass and/or Visa payWave certification appeared. A PayPass or payWave account can be assigned to the embedded secure element and/or SIM card within the phones. Android Pay is an application for devices running Google's Android OS, which allows users to make purchases using NFC, which initially required a physical secure element but this was replaced by host card emulation which was introduced in Android 4.4 (KitKat). Softcard (formerly known as Isis mobile wallet), Cityzi and Quick Tap wallets for example, use a secure SIM card to store encrypted personal information. Contactless payments with enabled mobile phones still occur on a small scale, but every month an increasing number of mobile phones are certified. In February 2014, MasterCard announced that it would partner with Weve, which is a joint venture between EE, Telefónica UK, and Vodafone UK, to focus on mobile payments. The partnership will promote the development of "contactless mobile payment systems" by creating a universal platform in Europe for it. In September of 2014, Transport for London's Tube began accepting contactless payment. The number of completed contactless journeys has now exceeded 300m. On Friday 18 December, the busiest single day in 2015, a record 1.24m journeys were completed by over 500k unique contactless cards. In 2016 Erste Group launched an NFC only debit card implemented as a sticker in Austria. It can be used at any NFC supporting terminal for transactions of unlimited amount however for transactions over the floor limit of 25 EUR a PIN is required to confirm the transaction. As with all payment devices, contactless cards have a number of security features. Depending on the economic space, there may be a payment limit on single transactions, and some contactless cards can only be used a certain number of times before customers are asked for their PIN. Contactless debit and credit transactions use the same chip and PIN network as older cards and are protected by the same fraud guarantees. 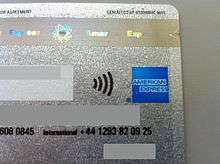 Where PIN is supported (e.g., not in the United States), the contactless part of the card remains non-functional until a standard chip and PIN transaction has been executed. This provides some verification that the card was delivered to the actual cardholder. To reduce the likelihood of identity theft, a contactless card does not contain the cardholder's actual name; instead, a placeholder name is used. Under fraud guarantee standards U.S. banks are liable for any fraudulent transactions charged to the contactless cards. Because no signature or PIN verification is typically required, contactless purchases are typically limited to a set amount per transaction, known as a "Floor Limit". Australia No limit For transactions over A$100 a PIN is required. Austria No limit For transactions over €25 a PIN is required. Additionally only three transactions can be made without a PIN. Canada No limit Limits are completely at the discretion of the merchant's acquiring bank and the consumer's bank. There is no law limiting the amounts. Croatia No limit For transactions over 100HRK PIN or signature are needed. Czech Republic No limit For transactions over 500 CZK PIN is needed. For every 3 consecutive contactless transactions PIN is needed. Denmark No limit For transactions over 200DKK PIN is needed. Sometimes PIN is needed anyway to ensure the card is used by its owner. Hungary No limit For transactions over 5000 HUF PIN is needed. For every 3 consecutive contactless transactions PIN is needed. India Rs. 2000 Above Rs. 2000 Contact chip transaction needs to be done. Ireland €30 Previously €15 until 1 October 2015. Lithuania No limit For transactions over €10 a PIN is required. Malaysia RM 250 After RM 250 (roughly US$50), PIN is required. Netherlands €25 For more than €25 at once or €50 in a row PIN verification is mandatory. New Zealand No limit For each transaction over NZ$80 a PIN is required. Norway 200 NOK For each transaction over 200 NOK a PIN is required. Poland No limit For transactions over or equal to 50 PLN PIN is required. Russia No limit For transactions over ₽1000 PIN or signature is required. Slovakia No limit For transactions over €20 PIN is needed. For every 3 consecutive contactless transactions PIN is needed. Taiwan No limit Signatures may be required for large purchases. Turkey 50 TL Transactions over 50 TL require PIN entry. United States of America US$25 The actual floor limit is set for each merchant based on the card issuer's risk assessment and other factors. US$25 is the lowest value found, but US$50 is also very common. For lower risk merchants, or those willing to pay a higher "discount rate", a floor limit of US$100 (as found at Costco), or even more, may be assigned. ↑ "New MasterCard Advisors Study on Contactless Payments Shows Almost 30% Lift in Total Spend Within First Year of Adoption". newsroom.mastercard.com. 2012-05-03. Retrieved 2013-03-13. ↑ Dubinsky, Zach. "New credit cards pose security problem". CBCNews.ca. 2010-06-02. Retrieved 2010-06-03. ↑ "McDonald's testing e-payment system". USA Today. 2001-05-29. ↑ "First Fully Integrated Contactless Payment System in UK". www.paymentnews.com. 2008-03-26. Retrieved 2012-08-26. ↑ "Barclaycard rolls out Oyster payments card". Finextra. Finextra. September 2007. ↑ Campbell, Francis. "Contactless payments taking off in the UK in 2015". mobiletransaction.org. Retrieved 16 December 2015. ↑ "Orange and Barclaycard deliver next step in their partnership with contactless co-branded credit card". Barclaycard. Barclaycard. January 2010. ↑ "Barclaycard and Orange unveil pay-by-mobile service by Garry White". Daily Telegraph. London. 2009-03-08. Retrieved 2010-08-06. ↑ "Certified phones". nfc-phones.org. Retrieved 2015-02-07. ↑ Villarreal, Alexandra. "MasterCard, Weve partner to accelerate contactless payments shift in U.K." Bank Credit News. 2/10/2014. Retrieved 2/10/2014. ↑ "Contactless has caught on underground". Barclaycard. Barclaycard. February 2016. ↑ "BankCard Sticker". Erste Bank und Sparkassen. Erste Bank Group. January 2016. ↑ "MasterCard® contactless". MasterCard. MasterCard Australia. Retrieved 18 February 2016. ↑ "Visa payWave: FAQs". Visa Australia. Visa. Retrieved 18 February 2016. ↑ "Maestro® kontraktlos". Maestro. Maestro Austria. Retrieved 4 July 2016. ↑ "Dankortet bliver nu kontaktløst"
↑ "Contactless cards". Swedbank. Retrieved 2016-09-01. ↑ "Mijlpaal: 100 miljoen contactloze betalingen | CCV Holland". www.ccv.nl. Retrieved 2015-11-20. ↑ "Apple Pay 100% Backed By UK's Major Banks -- Including Barclays". Know Your Mobile. Retrieved 2016-05-04.